Beach side view of condo complex. Saving the best for last, the Coulson condo is located on the south end of Ft. Fisher right behind the Fort Fisher Civil War Museum. 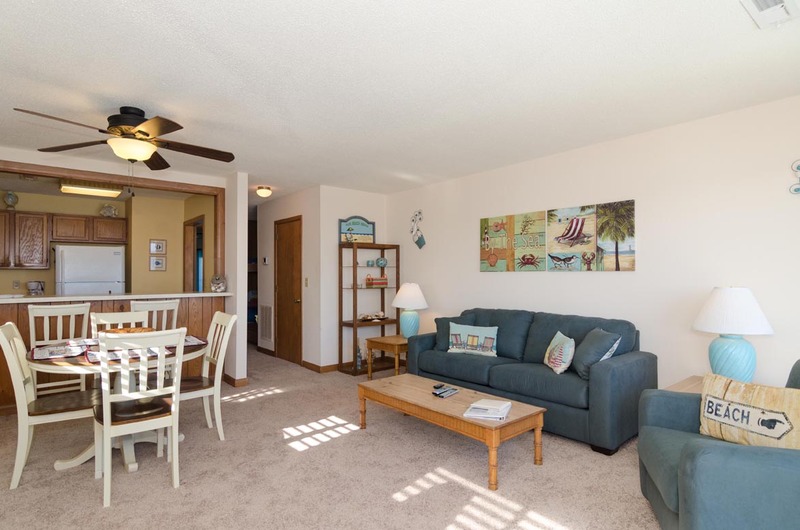 This is a cozy 1-bedroom/1-bathroom condo that features beach style decor with a panoramic oceanfront view from the living room, a quaint dining area and cozy kitchen. The alcove in the hallway offers 2 bunk beds. 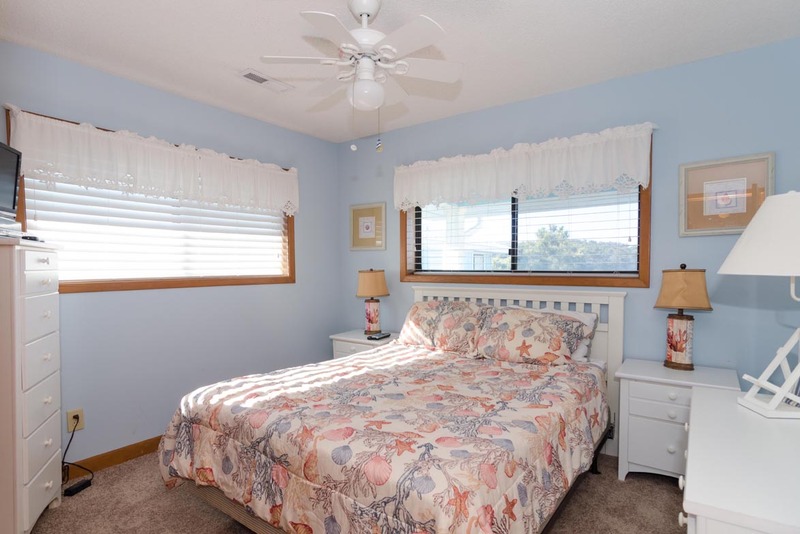 The master bedroom is street side with a queen-sized bed and new bedroom set. Recently upgraded, this condo offers all new appliances, new flat screen TVs and Wi-Fi. 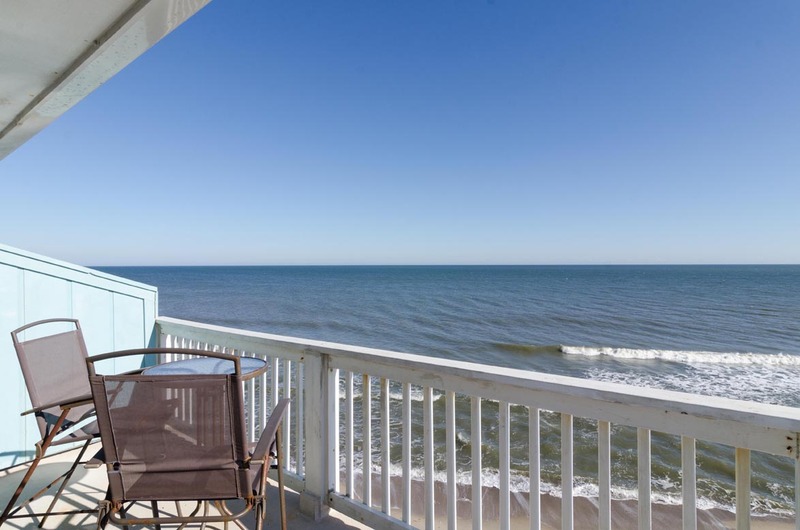 The large oceanfront deck has amazing views of the Atlantic and plenty of room for outdoor dining. Enjoy a swim in the oceanfront pool or a seaside stroll on the beach. Just a short driving distance from the condo are the NC Aquarium and Fort Fisher Civil War Museum. 1 assigned parking spot on site with additional parking for one car across the street. Recent, costly beach re-nourishment prohibits any one walking on the sand bags that protect our beach. Boat trailers prohibited. Sleeps 6. No smoking and no pets. The location is great. The condo is right next to Ft. Fisher State Park. There are lots of activities available and we could not fit it all into a week. We will need to visit the area again. It was awesome. We have stayed at this location for several years now, and we keep coming back. This year the keyless entry system and linens service made the experience all the greater. We will be back next year. This was either the 3rd or 4th time I’ve stayed at this property. ( not consecutively). The condo is exactly the same. No updates are ever done. I kept thinking that one day there would be a new coffee pot but that never happened. This rental has an amazing view but the interior looks as if it’s from the 1980s and doesn’t ever change. The sofa couch is not fit for sleeping on and it has 4 flights of stairs to climb to get to it. The beach is disappearing and inaccessible during high tide as the sandbags ate the only thing you can see. Thank goodness we found a hole in a fence back by the street to go through and be able to return to the unit when we were by the rock wall. I will no longer be staying at this unit or with Bryant. Hi Ann, thank you for your feedback. We are sorry to see you go and hate to hear that you have been so unhappy with us. Obviously, we have no control over the number of stairs to the unit, but had we known that it needed a new coffee pot, one would have been brought to you immediately. We have certain household staples in stock at the office ready to tag-in if something breaks in a unit. Since your review, the coffee maker has been replaced. Fortunately, the town of Kure Beach renourishes the beach every year to maintain the sand. This is a process that started many, many years ago, and us locals and devoted Kure Beach visitors appreciate it deeply. As for the furnishings, we will be sure to pass your words along to the owner. She might be excited to do some redecorating in the off-season. We hope you have a wonderful summer, and we wish you the best of luck in your future rental searches. 1st time we have stayed at a condo and it was very nice. Rooms were very clean and the beds slept comfortably. Everyone had a great time. Location was great because it was within walking distance to the trails at Fort Fisher. We had a blast the apartment was very nice. Did have to go buy a big pot to cook and the table and chairs were rusted and broke out on the deck but other than that things were great. Thank you for your review, we are so glad that you had a good vacation. We have purchased new chairs for the deck. We look forward to seeing you next year. 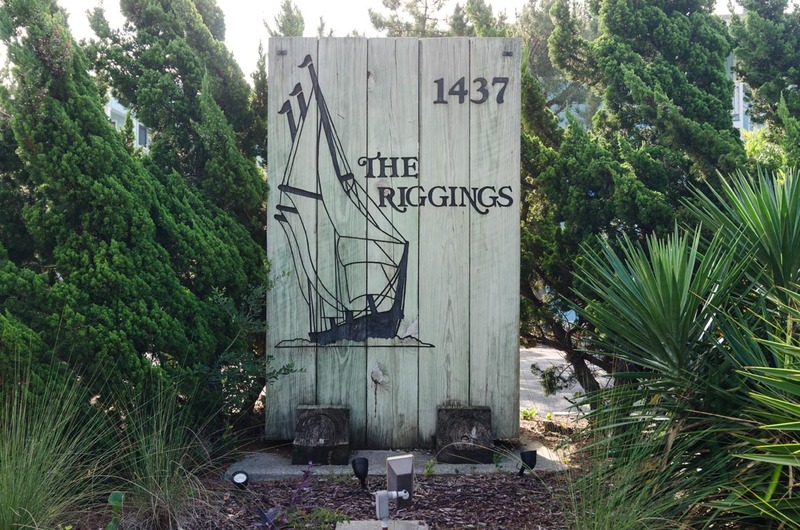 We stayed at the Riggings in the Coulson condo which was a very nice accommodation, older but nicely decorated with comfortable master bed and lovely living room/kitchen. Three flights up which was fine for us wanting exercise. Being an older building super close to the ocean and protected by sandbags, the floors were not level which made it feel a bit like a gravity fun house. The locks on the balcony doors did not work and the screens stuck. I wish the front door had a more secure lock too, however, it felt like a safe place. The condo building next to the Riggings was under construction and full renovation, so that was a downside. However, we really enjoyed our short stay at this sweet condo, very nicely priced for those watching their budget! The pool was not open yet, but it looked clean with a new deck. The house fit our needs perfectly. We loved the quiet area at the end of the beach. Easy walk to Fort Fisher and more. Bryant Real Estate maintenance staff were prompt and professional regarding the one minor problem we had. A very nice, quiet area with the option of traveling just a couple of miles to Carolina Beach for all the restaurants and shops etc. the condo itself is nice; the pictures are very accurate except for the patio furniture (which I'll get to later). Having the pool right next door was very convenient when you wanted to take a break from the hot sand and crazy waves. It would have been nicer though if they had more tables with umbrellas (there was only one when we got there and we got the guy who was cleaning the pool to bring out another one). as for the patio furniture, when we checked in on saturday, there was only ONE chair and a rusted out, unusable high top table. we called have them replaced and at first was told that they probably couldn't come out until after the weekend; which was unacceptable. They finally did make it out that day with 2 plastic cape cod chairs, which missed the mark of expectation since they were lower to the ground putting you at eye level with the top of the deck railing. we were told that they would try to get something better out to us later but we never heard back from them about it again. I felt like the whole situation was ridiculous considering the relatively low cost of a patio set, an issue that was well known from all the other comments on here. I had even sent them a message a week before our trip regarding the patio furniture via their app but never received a response. I don't want to make it sound like the patio furniture ruined our trip or anything, i just felt like it was an easy fix to make out stay even more enjoyable. overall, we really liked area of Kure Beach and Carolina Beach and the condo complex was nice too. We appreciate your review and are glad that you liked your accommodations. We have spoken with the owner and plan on replacing the patio furniture. Had a wonder relaxing vacation. Only thing is the furniture on the deck was rusted. Hi Cynthia- thank you for your feedback. We are so glad you enjoyed your vacation! We will have maintenance check on the outdoor furniture to see if it is salvageable, or replace if necessary. Thanks again- we hope to see you back soon! So the unit we stayed in was a little outdated, it had carpet which seems like a really bad idea for a beach house, in the bedroom was this ceiling fan which wobbled so badly on fast speed that we were quite scared it would come crashing down on us in our sleep, and I'm not really sure but there was this completely rusted out metal table on the deck we called the tetanus table because for sure 1 scratch from this table you would be visiting the local hospital for a tetanus shot, not sure why it hadn't been thrown away like a year ago, but overall really it's not that bad of a place to stay for a week on the beach on a budget. Hi Charles- thank you for your feedback! We will certainly pass your comments along to the owner- the off-season is the perfect time for upgrades after a busy summer! We will also make sure maintenance checks on the ceiling fan. Thanks again for bringing these things to our attention- we hope to see you back at the beach again soon! It wasvwonderful. Could've only been better without rain! We have stayed in the condo four times now but this was the best especially with all of the updates. A Place on the SAND! at the Edge of the Surf!!! Renting here for nine Winter months. View is stupendous. I'd happily stay here years! Stairs to 3rd floor a bit much; the view is worth it. The building seems very sturdy. Some furnishings were soiled. Outdoor furniture & front screen door VERY RUSTED. Some Formica counters peeling apart. Kitchen pots and glassware inadequate, but I brought my own, so no biggie. Ah, the view and the double screen doors: AMAZING. Only one screen though. Its like being on a high high chair on the sand at the edge of the surf. I love it, but it may not be for everyone. Maintenance staff VERY FAST to respond. No issues with heating nor AC! Good water pressure, small washer and dryer perfect! Awesome stay! Weather beautiful ! As always, very relaxing. Suzanne- Happy to hear you had a great stay! Hope to see you at the beach again soon! Had a real nice time. everything was as great as always. been coming to this location for 30 years. Its the best. A fish cleaning station would be nice. Roger- Great to hear you've been coming for so many years! Look forward to your next visit! Perfect Location on the beach! This condo is in the perfect location! 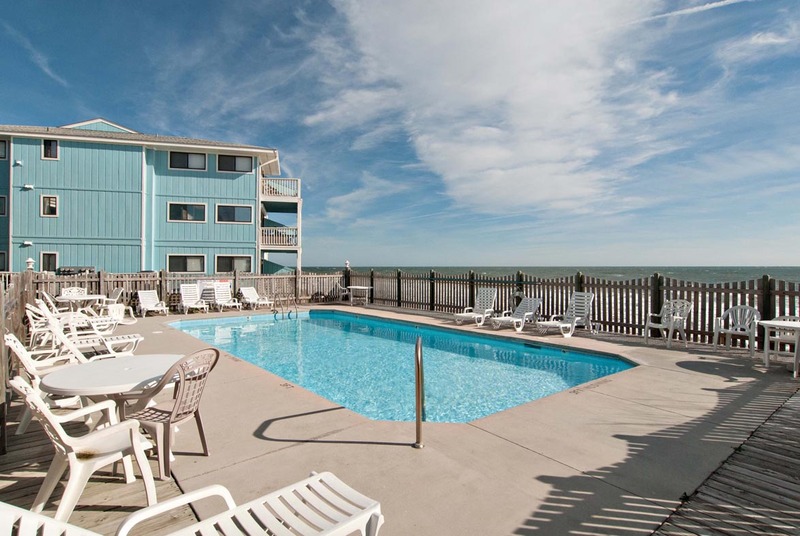 The complex is the last one at the end of the beach before Ft. Fisher, and this unit is on the 3rd floor, you can see ocean in all directions, and the pool too. The condo is clean and comfortable. It has everything you need. The pool is great: clean, warm, perfect. We've stayed in this unit both times we visited Kure Beach, we love it so much, we don't want to try another condo. Erin- We are glad to hear everyone enjoyed! Hope you'll visit again soon! The unit was fairly nice and relatively clean although there were snack crumbs(orange) on the living room floor. It was well decorated, but there were no instructions on how to operate the tv's in the living room and bedroom. I had a problem at first getting the A/C on but eventually it started working and did fine. We loved the location and closeness to the water (20 feet) and very private and the balcony, although the furniture could stand replacing. The ocean are could have been a little better lighted. No lights at night except 4 corners of the pool. This is the perfect property for people who love the ocean and want to stay as close as possible without having to bob around on top of it. And to be in walking proximity to a protected, often deserted state beach...well, we could ask for nothing more except additional vacation time. This was a good place to stay for a weekend getaway. It is definitely oceanfront with spectacular views. It is quiet. It is cozy. It is not fancy. It lacks charm. The beach here is very narrow. The pool is a stone's throw away and well maintained. I'd stay here again. Worth the rental fee,definitely! Our experience was excellent. The condo was clean, well prepared and perfect for our family. Bryant Realty provides excellent service, is responsive and accommodating. This is our fifth time at this complex, third time in this particular unit. We will be back. We loved our first stay at kure beach! Our unit was very nice. There were a few downfalls the AC unit was set at 70 and by mid afternoon the temp in the unit was up to 78. We were not able to find a pizza cutter or strainer in the kitchen. The toilet broke while we were there and they had it fixed the next day but we requested to be notified first so we could be there with our stuff. No call and maintenence entered our unit without us present. There are bricks holding the bed up on its legs in the bedroom. But the view was AMAZING. All in all we had a great time! I have to say that I really enjoyed my stay in the Coulson condo at Kure Beach. The view was incredible, access to beach and pool was easy. Condo itself was clean and bigger than I imagined. Will definitely be staying here again in the future. About as close to the ocean as is possible....you feel like you can jump off the balcony right into the water at high tide. Beautiful sounds of waves breaking! Overall, a very nice place to stay. The interior is a bit dated, but not a deal breaker. Kitchen is adequately stocked if you want to prepare your own meals, but condo is conveniently located to local spots for breakfast, lunch, or dinner. Located at entrance to Fort Fisher. Overall, we had a good stay. We have been renting units at a beach for 25 years. This was our first year at Kure beach/Carolina Beach. The unit was clean, but needed a little dusting. No big deal. It is sad to see that it is sinking into the ocean, noticeable by the sloping floors. Typically most rentals have horrible knives, and we have learned to bring our own. Surprisingly it has very good knives! All of the accessory type appliances are very low dollar. The coffee comes out luke warm, and the burner barely keeps it there. The microwave and the toaster did work well. We had to purchase a can opener and a pair of tongs, and should have purchased a spatula...With these small exceptions we were very happy. We absolutely loved our week. My wife and I described every day to be an absolutely glorious day, and the word just fits our experience. The view off of the deck is a sight to behold and you could not ask for a better location. The condo is everything as advertised. Clean, well maintained and again, that view. Customer service from Bryant is beyond reproach. They do everything in their power to make your stay an enjoyable one. 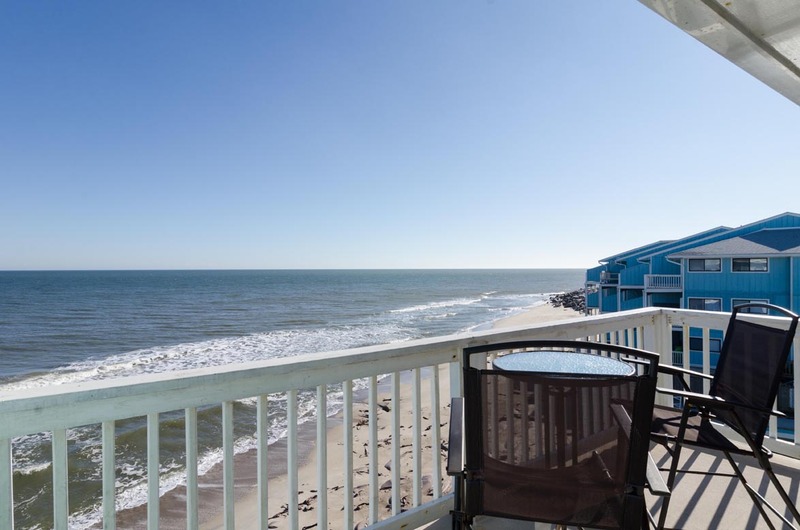 We would highly recommend this property to all who want to visit and truly be ocean front! Did I mention what a view?!? Clean & Cozy, ON THE BEACH. Great communication, directions, accessibility, location, setting, function, value... Great Overall experience.